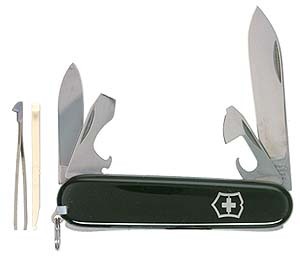 CLOSE OUT $22.50 Victorinox 53243 Recruit Black Genuine Swiss Army Brand knife, 6 tools 10 fun, 3-1/4" closed length, Swiss cross in plastic handle, Gift box. Made in Switzerland. Box Size: 4-5/8" X 1-7/8" X 3/4"
Knife Handle 1/2 in. 1-3/4 in.